The Walsall Life Help Station works through the ethos, values and Mission of the Life Charity in working to create a just society which has the utmost respect for all human life from fertilisation and that opposition to abortion has to go hand in hand with the provision of alternatives. Upskilling classes for pregnant women or mums of young children in the form of budgeting, parentcraft, ESOL Classes, Self-esteem, Effective Communication and much more. Walsall Life House is a safe house where up to 6 women that are pregnant or have a toddler can live. Here they are supported with parenting skills, health and wellbeing and given a true value of family. 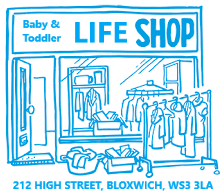 The Church Life Shop (212 High Street) was established by Bishop Marcus Stock, when he was parish priest at St Peter's Church, to raise funds to support the Deanery Life Group in their project work to help the local people of the area. The Life Shop is self-sufficient in paying for its own upkeep, and at the end of year any profit is given to the Walsall Life Group with the condition that it supports the work at both the Help Station and the Walsall Life House. Late and worried? Unexpected pregnancy? Pregnancy loss? Had an abortion? Considereing abortion? Pregnant and nowhere to live? Pregnant and needing practical help? Want to help someone else? We are a prolife charity and do not refer for abortion or give information about abortion providers. ​Pregnancy Matters is a trading name of Life 2009 which is an organisational member of the British Association of Counselling and Psychotherapy (BACP) and subscribes to BACP's ethical guidelines.